CallingPost simplifies your life and your holidays. Send messages to your: Sunday school class, visitors, congregation, nursery workers, Bible study members, choir members, and many more. Here is an example of how your church can use CallingPost to send out reminder messages to your group to ensure that no one gets left in the dark this Christmas. 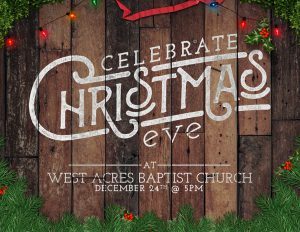 West Acres Baptist Church in Augusta, GA sent a special CallingPost message to their congregation to remind them of the times for their Christmas services. Click below to hear that message.